What is the best long range antenna? If you’re a real “DXer,” you’re out there trying to get those stations from 80, 90, or 100 miles away. I can’t promise that anything we offer you will really succeed, but if you’re going to try, you’ll definitely want to start with the best hardware. 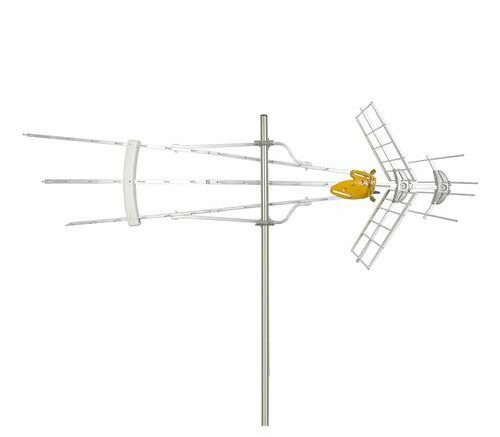 My personal favorite is this Televes DAT790 LR Mix antenna. While it doesn’t have the sexiest name, it’s an incredibly capable antenna. Some antennas may be bigger, but I can’t think of one that’s better. It does, but raw size isn’t really the consideration here. If you’re looking for VHF frequencies, you need an antenna that’s an even fraction of the wavelength. Usually antennas are 1/4 the wavelength of the channel they’re trying to pick up. The closer your antenna is to that precise length, the more likely it will pick up very weak signals. For UHF channels, their higher frequency means that it’s much easier to pick them up with an X-shaped or loop-shaped antenna. In this antenna, the actual receiving surface for UHF is a small X-shaped piece of metal at the end of the yellow plastic part. That’s the only part that picks up UHF on this whole big antenna. So why is it so big? The rest of the antenna is either a reflector or a director. Directors sit in front of the receiving element and act like magnifying glasses, focusing the signal so as much as possible can be pulled in. If you look at the picture above, the directors are the posts sticking out to the left and right of that long pole. They may not look like lenses, but they actually do act like them. The reflectors are the large panels at the top and bottom with the white plastic on the left and right. They act like mirrors, focusing even more signal on the back side of the receiving element so that you get every possible bit. These reflectors and directors are very effective, and they work because of the size of radio waves compared to the size of visible light. Visible light has a very, very small wavelength, measured in thousands of a millimeter. Radio waves have wavelengths measured in meters, so like 10,000 times larger. Because of this, metal posts can behave like glass mirrors, since the wave is so large it can’t get past these posts. An antenna would work just as well if it had large glass lenses and big glass mirrors instead of reflectors and directors, but it would be a lot more heavy and more delicate. Amplifiers are used in antennas to help overcome loss due to cable lengths. Digital signals respond differently to amplification than the old analog signals do, so simply amplifying an antenna signal isn’t going to get you a lot of benefit in many cases. With digital, you either have a signal or you don’t — or more precisely, the signal is either stronger than the noise around it or it isn’t. If it isn’t, then no amplifier is going to find it. However, an amplifier can compensate for some of the loss due to electronics and cables, and if a signal is very weak but still detectable, it can sometimes be made stronger by an amplifier. The best long range antennas have amplifiers with auto-gain control so that they’re delivering the best performance without burning out your TV’s tuner. When you’re shopping for an antenna to try to pick up stations over 70 miles away, know that there are no guarantees at that distance. A larger antenna will work better than a smaller one in general, and putting it up higher will help avoid loss from trees and hills, but every situation is different. You may not get any signal at all, and if you do, it may go in and out. We’re happy to help, but it’s important to know that people who really do try to get stations at that distance usually end up buying more than one antenna until they find the one that works. VHF and UHF… what’s the deal?